This isn’t your grandmother’s old handbag. 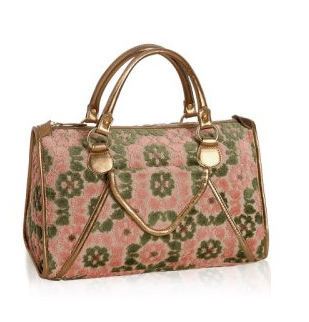 Vintage-y carpet bags are making a comeback, and Tocca does the trend right with the Pink Flocked Carpet 'Stella' Satchel. Pink and green printed flocked velour ‘carpet’ fabric is threaded with metallic strands and topped off with gleaming gold faux leather. A front and center envelope pocket adds a dash of antique flair. On sale now for $114.74 at Bluefly.